“Hi, it’s *mumble, mumble*. I hear that you know something about vet work and animals.” The voice sounded strained. 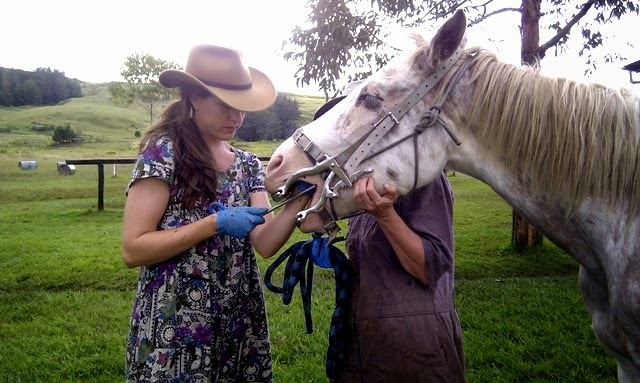 In Papua New Guinea (PNG) in general, veterinary access is extremely limited, and it’s no different up here at our linguistic centre of Ukarumpa. So, over the past few years (as a result of my background with critters), I’ve somehow become the contact person for many of the medical situations that arise—from urinary tract infections to litter box training to cane toad poisoning and gangrene. I’ve splinted a puppy’s legs, treated hot spots, and advised on cornea scratches, and helped with dog training—in addition to my work with the horses, which has included floating teeth (that’s playing equine dentist), treating arrow wounds and mysterious lamenesses, or trying to reverse secondary nutritional hyperparathyroidism (say that 10 times fast!). Last year, Rebekah and I even hopped on the motorbike and played travelling doctor as we ran a vaccination campaign of the centre’s dogs, and this past weekend, I organized for our one accessible vet to come up to perform some surgeries. Have vaccines (and needles, sterilized water, syringes)? Will travel! Ukarumpa has everything from chickens and ducks to beef and dairy cattle, horses, dogs, cats, guinea pigs, parrots, cockatoos, and even some exotics. Pets play an important role in maintaining the sanity of Ukarumpa residents, but many also are sources of income, food, rodent control, and security. But, I’ve never been called about a metal clip on a dog’s leg. This puppy was going lame, but now he's big, happy, and completely sound! Due to our lack of resources and my lack of professional training, solving some of the medical issues is like giving James Herriot a screwdriver and some antiseptic and saying, “have at it!” But, I’m grateful for Google, my medical library (yay for Saunders Manual of Small Animal Practice and Where There is No Animal Doctor among others), and a team of vets in US, Canada, and Australia, who occasionally advise me when I get in over my head. Aww, poor Grommit wearing a homemadeCone of Shame! In fact, this week was supposed to the second week of several animal husbandry workshops, led by a friend of mine who is a trainer with the Christian Veterinary Mission (read more about my training with this organization here). Animals play a huge role in the life of a PNG village, not only providing sources of income and food, but also interwoven into the very fabric of their culture. Unfortunately, lack of husbandry skills, first aid knowledge, and disease management in PNG villages can wreak havoc on animal populations, with an impact that ripples through the community. We were hoping to lead several workshops this month teaching on the basic management and care of pigs, chickens, and goats, first aid, common diseases, and protecting yourself against animal-to-human diseases (as well as using the time for discipleship, giving opportunities to study the role of illness and disease in the world and God’s response, the importance of life, and our responsibility as stewards for the environment around us). Unfortunately, unexpected health problems for my consultant and primary instructor travelling from the US caused us to cancel the workshops at the last minute. We hope to reschedule them at a later time (perhaps even this year). A few more questions about the carabiner-dog, and I set off on a quest to find bolt cutters (seeing as it was Sunday morning, what better place to ask around then at church? Although, I do admit that “Hi, how’s it going today? Do you happen to have bolt cutters I could borrow?” is not your normal after-service chit-chat). 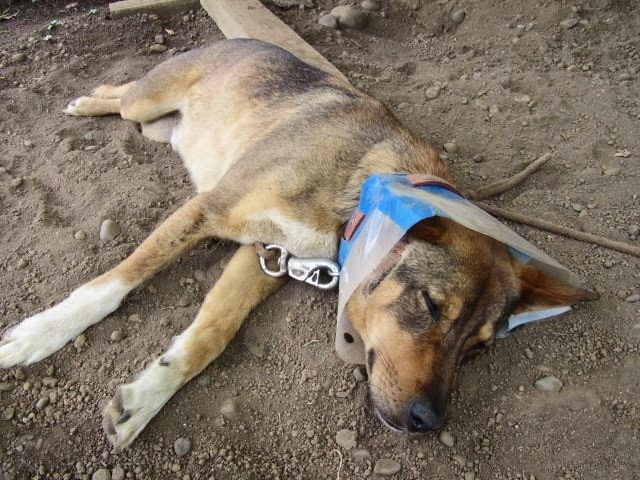 But, thanks to the Ukarumpa Fire Department, bolt cutters were found, and a dog’s leg was rescued. All in a day’s work!